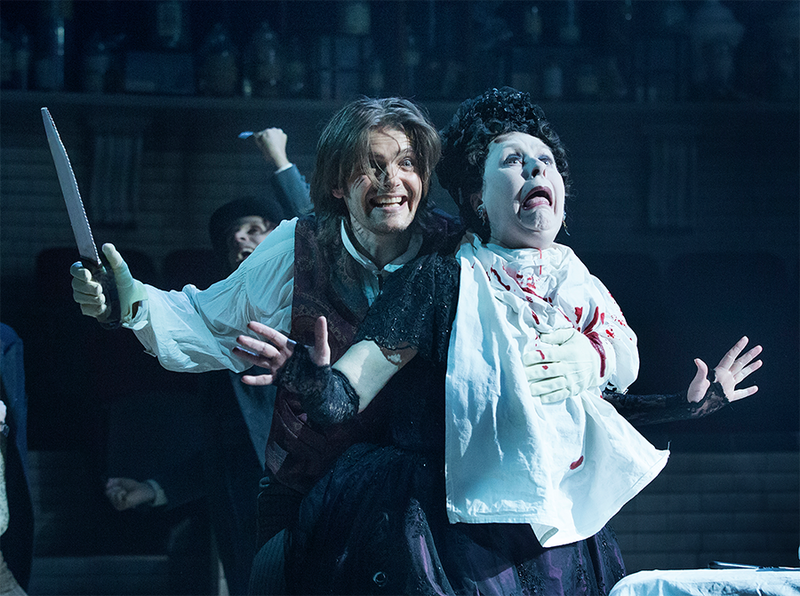 Please note: this review contains spoilers for both Jekyll & Hyde the musical and Det Ny Teater’s production. 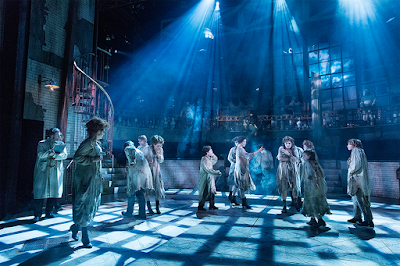 Jekyll & Hyde in Det Ny Teater, Copenhagen, is a chilling tale. Director Daniel Bohr has transported the familiar story of a doctor and his evil alter ego into a Victorian mental asylum, with psychiatric patients acting as the musical's chorus. Luckily, the decision is more than a visual gimmick. The theme of mental illness permeates the whole musical, creating a very unique version of the show. 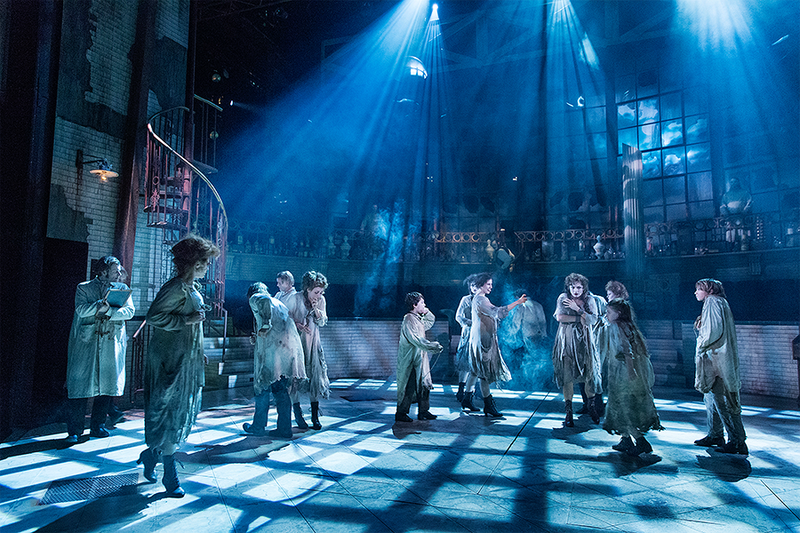 The production invites the audience into a dark universe without much hope, broken people populating the streets of London. It’s a surprisingly serious version of a musical that usually requires more tongue in cheek to function. The show has a stationary set designed by Paul Farnsworth. The scene resembles an old surgical theatre, with a part of the audience sitting onstage. The effect is nice, but acting-wise, it results in some awkward spinning around as actors try to make sure all audience members can see them. Farnsworth’s visuals are light in colour but unsettling in tone, costumes combining elements from straitjackets to Victorian-era styles and moon shining through broken windows. Tomas Ambt Kofod as Jekyll and Hyde is a slight disappointment. He has a lovely voice, but the way he portrays the role, part idealistic yet bland young doctor and part Captain Jack Sparrow… The Sparrow-ish antics, energetic movements and intoxicated glee might have been entertaining in some lighter-hearted production that focuses on the show’s campy aspects. In a somber version such as this one, the portrayal feels out of place. Before seeing it, I was afraid the Danish Jekyll & Hyde was going to be completely humourless. Having seen the show, I would’ve preferred no humour at all to the misplaced cheerfulness of Hyde here. Exploring the theme further, this production would have benefited from a decidedly scary, deranged, dangerous portrayal of Hyde. 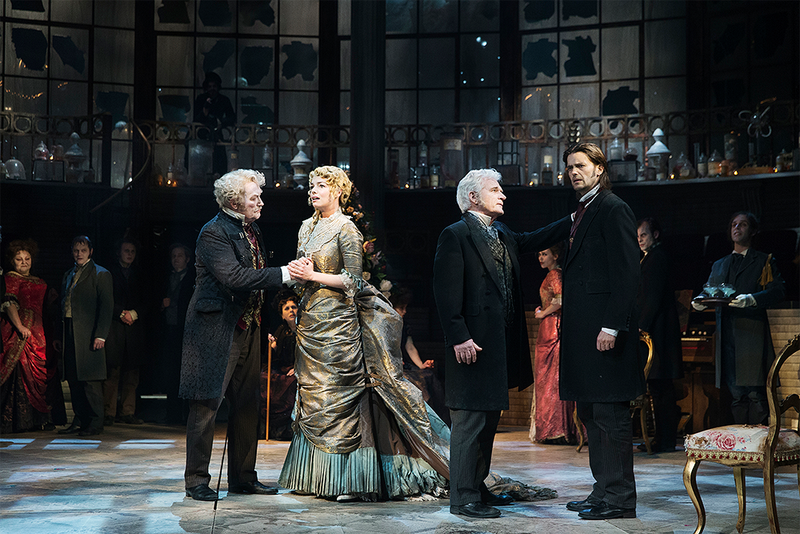 I enjoy it when Hyde enjoys the murders, and showing him having fun makes sense – but instead of the almost childish delight, this production would have needed darker, disturbing, sensual joy. Apart from Lucy’s murder, Hyde didn’t scare me. With mental patients energetically dancing around him during Alive… The choreography is nice, but being the biggest bully in your mental institution is hardly the most menacing thing you could be. Camille-Cathrine Rommedahl’s Emma is a fascinating, sorrowful character. Here, Jekyll's fiancée Emma is mentally very fragile. She seems frightened, unbalanced, unstable. With her condition in mind, Sir Danvers’s (Carl Christian Rasmussen) need to protect her makes a lot more sense than usually, as does Jekyll and Emma’s duet Take Me as I Am. Emma has problems with her mental health, Jekyll carries his own baggage with incurable illness running in the family… A Frank Wildhorn love duet given poignant meaning. Would you believe that? As the show progresses and London turns more dangerous, we see Emma getting more distraught too, with Sir Danvers having to calm her down. Finally, Jekyll’s death is too much for her and she is dragged away screaming. And yet Rommedahl’s portrayal also has its moments of joy and sunshine, moments where you can understand how she caught Jekyll’s attention in the first place. I had no idea Emma could be this fascinating and layered – and I’ve already seen some brilliant takes on the character. A fine, fine portrayal! Here, it is very easy to see why Lucy dreams of Jekyll. He treats her like a lady from the very first without making a fuss out of it, calling her Miss Harris and offering her wine like any of his usual guests. Small wonder a gentleman like that fills the dreams of a woman who usually faces nothing but abuse. Even my heart fluttered a little! 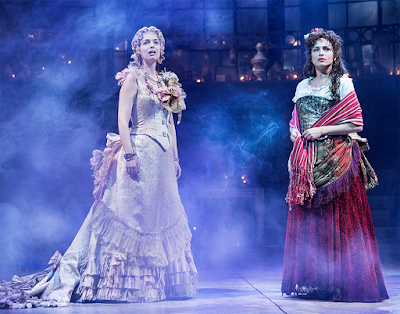 This is also the first production of Jekyll & Hyde I know of where Hyde explicitly confesses to being Jekyll – by taking on Jekyll’s intonation and calling her Miss Harris again – before murdering Lucy. A terrifying moment. If only Hyde could’ve been this frightening all the way through. Kurt Ravn, who plays Utterson, is a well-known actor in Denmark. 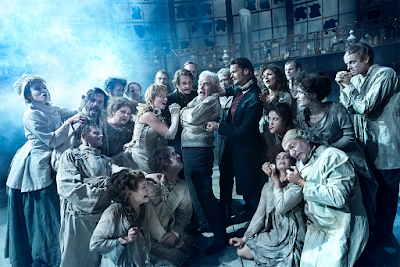 Ever since the new production of Jekyll & Hyde was announced last spring, I’ve been amused by Det Ny Teater’s way of advertising him (for example, see this article based on the theatre’s press release, with a silly promotional photo included. How many other Jekyll & Hyde promos are there featuring Utterson? None, I can assure you. I’ve been looking). Kurt Ravn is back on musical stage! As G. J. Utterson, Dr. Jekyll’s level-headed friend. Woo hoo! Moving on – to Spider, of all characters. Kim Hammelsvang Henriksen’s Spider was one of the happiest surprises in the production. The Red Rat’s pimp is a remnant of an earlier version of the musical’s script (he was originally the evil side of Simon Stride). Usually, he's a pretty boring character. In most current versions of the show, Spider threatens Lucy in two scenes, sings a couple of unnecessary reprises of Facade and disappears. Not this time! Not quite existing in the same reality as the rest of the characters, this Spider is the Che to Jekyll/Hyde’s Evita. That is bad news for me. I have a huge soft spot for narrator figures in musicals, the snarkier and creepier the better… So I’m kind of in love with Spider now. Shoot. At first, Spider performs his usual pimp’s duties in The Red Rat, mistreating Lucy and skulking around. When Hyde is born, Spider first acts as a sort of an underling to him, mostly staying out of the action but giving him a helping hand every now and then, cheering him on, periodically narrating and commenting the story via Facade’s reprises. In the second act, Spider’s presence grows stronger, with him observing the action and breaking the fourth wall. We see him taking notes of Hyde’s murders and then throwing his papers in the air when Jekyll meets his fate in the final scene. I didn’t really understand what the note-taking was all about, but I still enjoyed the character’s attitude – by the end, he is clearly enjoying the chaos and mayhem for chaos and mayhem’s sake. Actually, he seems a fair bit more dangerous than Hyde. All in all, I’m glad to see what this production has done to the usually useless character. With someone as charismatic as Henriksen in the role, the interpretation is a joy to watch. The production also features another narrator-type character. A mental asylum director played by Michael Lindvad opens the first act with Jekyll’s lines about good and evil and begins the wedding scene with Utterson’s lines about Jekyll. He also observes Jekyll/Hyde from the background during many scenes. I was actually looking forward to some great reveal that would justify his presence – maybe Jekyll, I am your real father, or I was R. L. Stevenson the whole time – but no. I felt the inclusion of this new character distracting at best. The show would have been better off if pimp-turned-narrator Spider delivered the hospital director character’s few lines. Unless they could be given back to Jekyll and Utterson or cut altogether, that is. Overall, this production isn’t really Jekyll’s story. Instead, it is a story about how one person’s disastrous decisions affect the people around him. How good intentions can lead to hell. In the first scene, we see Jekyll trying to help his father in a mental asylum. In the finale, his death is too much for Emma and Utterson. Both are taken into a mental institution. So in a way, Jekyll dooms both his fiancée and his best friend to similar hopeless existence he tried to rescue his father from. Lying to his best friend without a moment's consideration and keeping secrets from his bride until her already fragile mental health breaks, it is easy to disapprove of this Jekyll’s selfishness. But which one of us wouldn’t try to protect our own hide? It is easier to work for the common good and the betterment of mankind on an abstract scale, be it via creating a new medicine or donating to charity, than it is to admit our own mistakes and make personal sacrifices for our loved ones’ sake. Jekyll doesn’t have enough courage to do what’s right. Usually, I see Jekyll’s final act of taking his own life (though via Utterson’s hands) as a selfless one. Here, I’m not quite so sure. Thinking of what 19th century mental institutions could be like… I wonder if it’s Jekyll who has it easy, after all. Mind broken but young and physically healthy, what kind of a life is Emma going to have? Could her and Utterson’s downfalls have been avoided if Jekyll had confessed earlier? Or are all their fates sealed the moment Jekyll first lets the repressed part of his personality loose? Jekyll & Hyde is an interesting and worthwhile musical because it gives each new cast and creative team so much freedom. Every director working on the musical comes up with their own solutions to make up for the script’s weak aspects. The Danish cast and creative team have created a dark, disturbing, somber universe. The production deals with responsibility, cause and effect, and the way people affect each other – or, at least, that’s what it makes me think about. 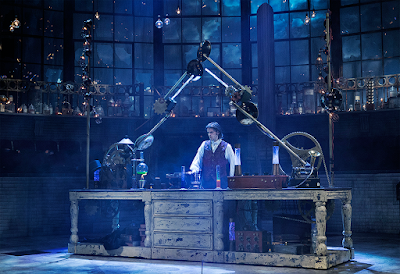 Det Ny Teater’s Jekyll & Hyde is a thought-provoking version of Frank Wildhorn’s entertaining yet flawed musical. No small feat, no small feat indeed. I applaud you, director Daniel Bohr and the cast and crew of this production. The show will keep haunting me for a while, in the best way. I agree with you on Jekyll's fate being the easiest one, at least in this case. Had he not died, he would have faced decades in an asylum, probably heavily guarded and in isolation. Not a fun life in Victorian England. 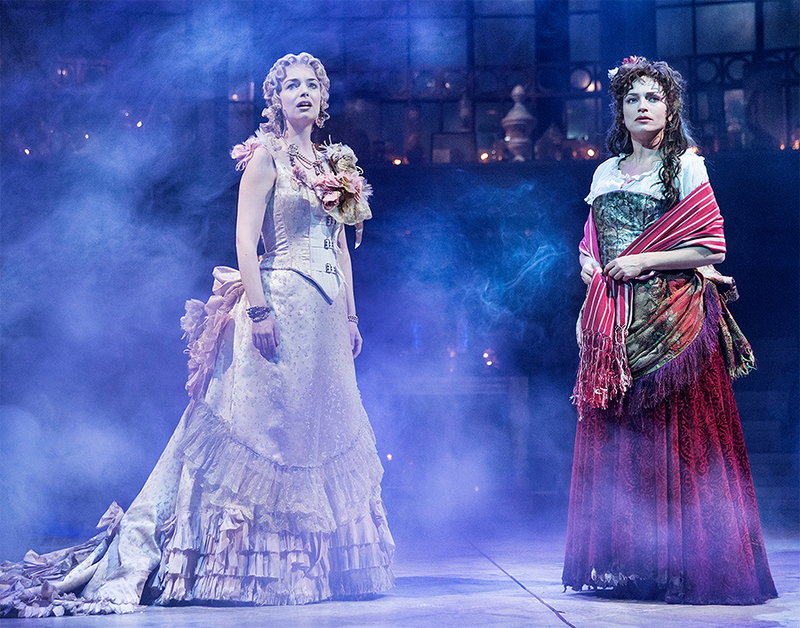 I remember seeing the pre-Broadway revival tour of the show with Constantine Maroulis as Jekyll and Hyde, Deborah Cox as Lucy and Teal Wicks as Emma. It was good in my opinion especially Teal's portrayal of Emma which I thought was in the same vein as Camille-Cathrine Rommedahl, in which she also made Emma a more three-dimensional character rather than a flimsy rich girl (kinda like what tends to be done with Cosette in "Les Miserables"). Interesting! I think I watched a full video of that tour on Youtube a while back – maybe I should give it another watch! I'm always glad when a production makes Emma more than the two-dimensional love interest.